Viet Nam and Sweden have agreed to accelerate the establishment of strategic parternship in such fields like education and training, science, healthcare and environment. The agreement was reached at the talks between Deputy PM, FM Pham Binh Minh and Sweden’s FM Margot Wallström in Ha Noi on November 23. FM Margot Wallström spoke highly of Viet Nam’s achievements in socio-economic development and international integration process over the past years. Especially, the Southeast Asian country has successfully host the APEC Year. 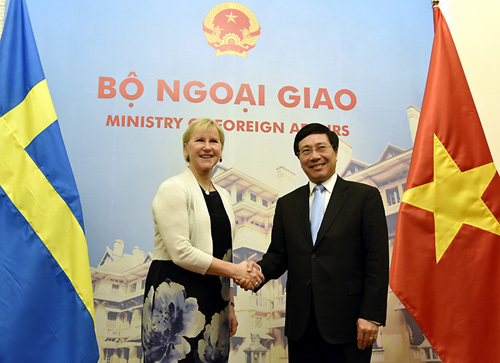 Sweden expects to further advance the traditional friendship and multifaceted cooperation with Viet Nam, she affirmed. Deputy PM, FM Minh extended thanks to Sweden’s valuable support and assistance to Viet Nam over the past struggle for national independence and the current course of development. He stressed that Ms. Margot Wallström’s Viet Nam visit from November 21-23 is of significant importance as the two countries are preparing for the 50th anniversary of their diplomatic ties in 2019, contributing to further enhancing the bilateral ties. Both sides agreed to foster the exchange of delegations, particularly high level ones and continue close coordination at multilateral and regional forums. Deputy PM, FM Minh suggested concrete measures to boost cooperation in key areas like politics –diplomacy, trade and investment, education and training, science and technology, security and defense. He also asked Sweden to accelerate the signing and ratification process of the Viet Nam-EU free trade agreement, share its startup experience, and help Viet Nam to improve legal system. The two sides also exchanged views on regional and international matters of common concerns, including East Sea issue./.